Copyright © 2015 USS PUEBLO Veteran's Association. All rights reserved. This page contains the conditions of use, disclaimers and copyrights. The USS PUEBLO Veteran's Association oversees the the contents of this web site. We may make changes to any part of this site or to these Conditions of Use at any time without prior notice. You may print out any of the materials from this site for your personal, non-commercial use only, as long as you give credit and keep intact all copyright and other proprietary notices. You are not otherwise permitted to modify, upload, post, copy, reproduce, transmit, retransmit, republish, sell, loan, rent, or otherwise distribute any materials, including images, from this web site. The use of any such materials on any other web site or computer network environment is also prohibited without prior written consent. If you use any such materials, other than as permitted in this license, you will be violating the association's copyright and other proprietary rights. 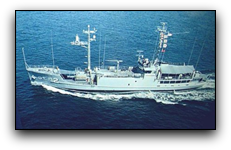 THE USS PUEBLO VETERAN'S ASSOCIATION IS NOT AFFILIATED WITH, NOR DOES IT MAKE ANY STATEMENT CONCERNING, NOR ASSUME ANY RESPONSIBILITY FOR THE ACCURACY OR CONTENTS OF ANY OTHER WEB SITES. The contents of any anecdotes, commentaries and stories are solely the responsibilities of their authors. The USS PUEBLO Veteran's Association and the Web Master are not liable for any offensive statements contained in any anecdotes, commentaries, or stories published on this web site. Materials other than those listed below may be protected by specific copyrights. Contact the owner directly. USA Flag - Copyright © 1997 XOOM Software, Inc. and its licensers. Satellite Image of Pyongyang quarters -Microsoft Terra Server, Acquisition date 10/29/86, Camera System KVR-1000, Field of view 1.5 km x 1.69 km, Copyright ©1998 SOVINFORMSPUTNIK and Aerial Images, Inc.
Information for contacting our Association officers is on the PUEBLO Veterans page. Advertising link requests: The USS Pueblo Veterans Association does not permit or accept any form of for profit advocacy or advertising. This includes LAW FIRMS dealing with Mesothelioma lawsuits. We accept links only from nonprofit veterans service organizations. All requests for other types of links will be refused without comment. !!! !